If you think you recognize this bedroom, good eye, because you do. It belongs to sweet little girl, who was still in her crib when we first met and transformed her room from meh to “amazing” (direct quote). Take a quick walk down memory lane and then come on back to see what we did next. 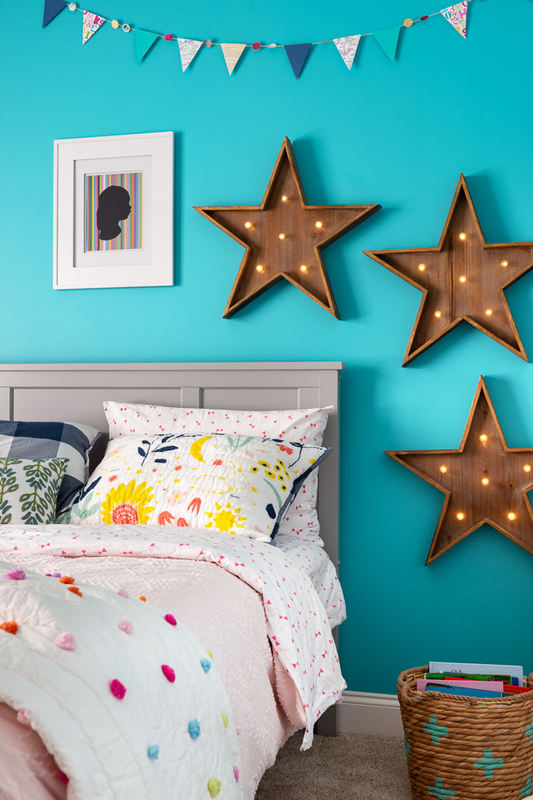 Our clients loved the light and whimsy we injected into her room, but now that she’s a bit older, it was time for a big-girl update. Fortunately, since we were already working with our fabulous design as the foundation, our transformation started with simply swapping out the little-girl bed for a full-size version and layering it with colorful and comfortable bedding. Next, we replaced the glider with a classic white nightstand and a fun lamp. We moved around some of her toy baskets and voila! Instant update for a growing girl. P.S. She still thinks it’s totally amazing.